Thursday night, the University of North Dakota Fighting Hawks did something they hadn’t done in their past six trips to the Frozen Four. They won a semifinal game. Thursday’s win in the semifinals was the first time since 2005 (4-2 win against Minnesota). UND would advance to the Frozen Four championship game where they would lose 4-1 to the Pioneers. Thursday, the game started slowly and was tied 0-0 after one period of play. In the second period, the momentum swung UND’s way. True to form, senior forward Drake Caggiula would spot UND a 2-0 lead, with two beautiful highlight-reel goals. Like everything else this season, the win didn’t come easy. The game almost got away from UND in the third period. There were a few anxious moments in the third period. Entering Thursday’s game, UND had a 25-0-2 record when leading after two periods. That record would be challenged when the Denver Pioneers tied the game at the 10:51 mark of the third period. UND fans were suddenly experiencing déjà vu all over again. In the end, this team wouldn’t be denied. Sophomore forward Nick Schmaltz would bail out the Hawks when he scored the game-winning goal with .56 second remaining in the game. Gardner would score an open net goal in the waning seconds of the third period to ice the game for UND. 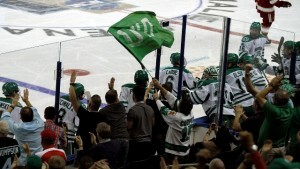 It’s well documented, the UND hockey team has a large, fanatical, loyal fan base. On Thursday night, the Amalie Arena was full of green and white clad UND fans. On the television broadcast, you could hear the UND fans chanting “Let’s Go Sioux”. This hasn’t gone unnoticed by the UND players. They acknowledge that having a loyal following gives them a big advantage. On February 26, 2016, the UND coaching staff assembled the Heavy Line. The less heralded Heavy Line consists of forwards Austin Poganski, Luke Johnson, and Rhett Gardner. Since that time, their job has been to check the opposition’s top forward lines. That trio has been relentless and hard to play against. During the past two games, they held the CCM Line and the Pacific Rim Line to a combined two points. Thursday, they continued their tenacious play shutting out the famed Pacific Rim Line. Next man up, has been a season long theme. When Luke Johnson suffered a lower-body injury after colliding with freshman Brock Boeser, Sanderson stepped up and took Johnson’s spot on that line. One of the big stories lines of Thursday’s semifinal game was the play of the CBS Line. They finished the game with 3 goals, 6 points. They were also a +9. Denver famed Pacific Rim Line was held scoreless and finished. That’s not a misprint, the Pacific Rim Lin had 0 goals, 0 points. They were also a minus-5. Over the past two seasons, UND has won 75 straight games when leading after two periods of play. On Thursday night, UND did something they hadn’t done in the last five visits to the Frozen Four. UND scored the first goal of the game.